The outside of the program for the concert honoring Syvilla Fort. 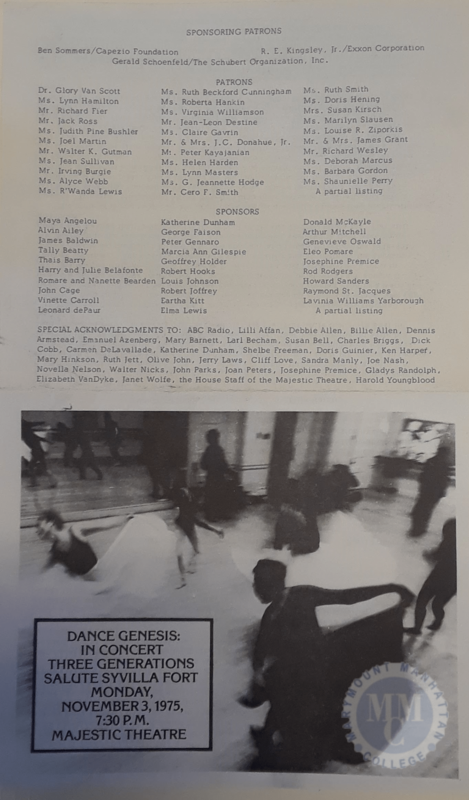 On November 3, 1975 the Black Theater Alliance held a concert in the Majestic Theatre at Marymount Manhattan College titled Dance Genesis: Three Generations Salute Syvilla Fort. Syvilla Fort, and influential choreographer and dance teacher, has been described as “an important figure in American dance” (Bocek 2016, 14) and as a “just plain good person” (McDonagh 1975, 34). The concert was hosted by choreographer Alvin Ailey and performer Harry Belafonte, both former students of Fort. Syvilla Fort herself was also in attendance. Syvilla Fort was born in Seattle, Washington to humble beginnings and began training in dance at a young age. She was trained at home because ballet schools in the area refused to accept a black pupil (Bocek 2016, 14). But Miss Fort didn’t just stop with training, she also helped to organize dance classes for children in her neighborhood (Bocek 2016, 14). After high school, she attended the Cornish School of Allied Arts in Seattle where she became the school’s first black student. It was there that composer John Cage wrote the music for her Bacchanale in just three days. This would become the famous avant-garde composer’s first piano composition (Kostelanetz 1987, 90). Fort left Cornish to perform with the Dunham Dance Company. Under the tutelage of dancer Katherine Dunham, Fort learned the Dunham technique, a style of dance that incorporated Afro-Caribbean elements (White-Dixon 1991, 25). Later, Fort and husband Buddy Phillips opened a dance school in Manhattan where she taught Ailey and Belafonte among others. In this studio Fort would combine the Dunham technique with elements of modern dance to form her own distinct style of dance. Fort was also chosen by the Government of Guinea to “develop a dance company” in the nation (Syvilla Fort, a Dance Teacher Who Inspired Blacks is Dead 1975, 71). At the concert, Ailey praised Fort calling her “the foundation for black dance” and noted that she taught her students to “experience joy that is dance expression” (Syvilla Fort: A Dance Teacher Who Inspired Blacks is Dead 1975 71.) The concert highlighted the Afro-Caribbean influenced style of modern dance that Fort choreographed and taught in her school. Syvilla Fort was a shining light in the world of dance and her distinct style of dance remains influential. But Fort should also be remembered for her generosity and spirit of kindness. Sadly, Fort would succumb to cancer at Sloan-Kettering Memorial Hospital just five short days after the concert honoring her legacy and influence. Bocek, Maximilian. 2016. “Bonnie Byrd & Company.” Cornish Magazine (February 2016), March 17, 2019. https://issuu.com/cornishcollegeofthearts/docs/cornish_magazine_jan2016. Kostelanetz, Richard. 1987. “Ur-Conversation with John Cage.” Perspectives of New Music, Vol. 25, No. 1: 88-106. https://www.jstor.org/stable/833093. McDonagh, Don. 1975. “Gala Honors Syvilla Fort In the Dance.” The New York Times, November 5, 1975, sec. Archives. https://www.nytimes.com/1975/11/05/archives/gala-honors-syvilla-fort-in-the-dance.html. The New York Times. 1975. “Syvilla Fort, a Dance Teacher Who Inspired Blacks, Is Dead,” November 9, 1975, sec. Archives. https://www.nytimes.com/1975/11/09/archives/syvilla-fort-a-dance-teacher-who-inspired-blacks-is-dead.html. White-Dixon, M. “The Legacy of Black Philadelphia’s Dance Institutions and the Educators Who Built the Tradition” Dance Research Journal, Vol. 23, No. 1: 25-30, March 17, 2019. https://kopernio.com/viewer?doi=10.2307/1478695token=WzMzNTc1NiwiMTAuMjMwNy8xNDc4Njk1Il0.rF6t7XDFyR0El9g5PaJdOkhN8xc.